Before we say goodbye to 2017 and succumb to some hefty festive indulgence, I want to say a few words in what will be my final blog post of the year. It’s been an incredible year. I’ve had such a fun and exciting time in the allotment and on the blog. I sincerely hope the past 12 months have been wonderful for you too. This fabulousness has come in a very large part from you. I’m overwhelmed by the number of people who read Sharpen Your Spades and I’m thrilled with all the wonderful, engaging and helpful comments you provide on the blog and of course, through the magical community, on social media. The end of the year is traditionally an opportunity to reflect (as well as stuffing your faces with turkey and beer!). I hope you will look back on the experiences you’ve had in your garden and allotment positively – whatever’s happened on your plot this year. There are no mistakes when it comes to growing your own. Well, I prefer to see such things as ‘learning experiences’. What works for me in my allotment, might not work for you in the same way on yours. We gain knowledge of our own, individual green spaces and we simply make the appropriate changes next time. 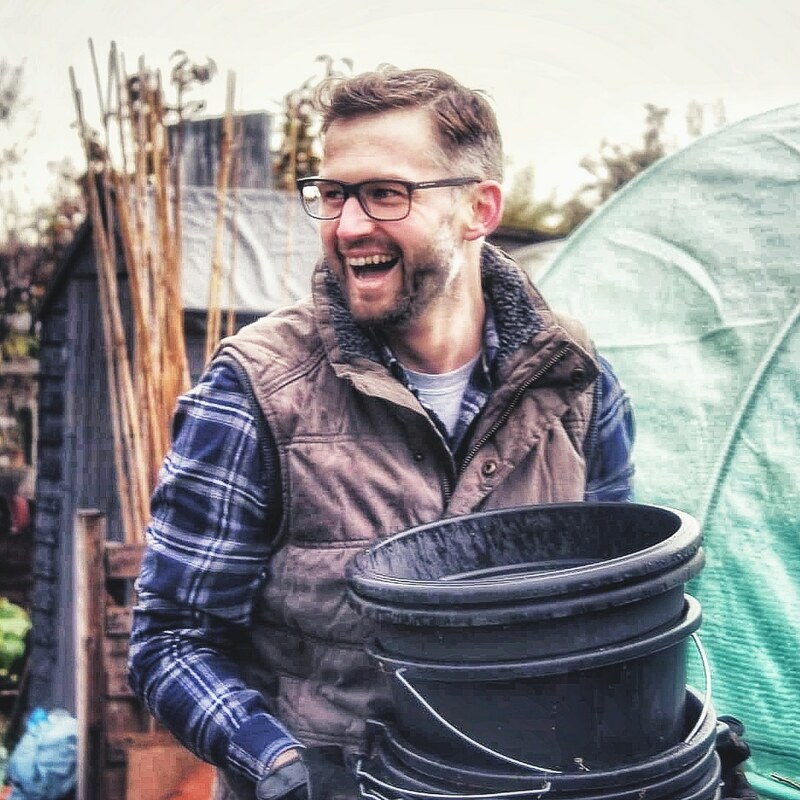 I’m passionate about growing fruit and vegetables in our family allotment garden, and through the blog, I want to inspire anyone to pull on their wellies and join in the movement to grow their own. Ava, my seven-year-old daughter is a huge component in how I choose to garden. I want her to grow up with a strong relationship with food, understand where it comes from and be thrilled to eat it and I want others to join in too. Like most families, we have busy working lives and I understand the idea of taking on an allotment can be daunting. However, I genuinely believe it’s possible to manage the daily life and enjoy all the benefits of a kitchen garden too. If not an allotment then in a small garden, a few pots or a windowsill. I’ve tried and will continue to shape this blog as a resource to enable as many people to join in and experience the benefits that accompany grow your own gardening. I need your help with this ambition. I’m a receptive blogger and I want to hear from you. Tell me how to do this job better, either through the comments here on Sharpen Your Spades or through any of my social media channels. I’m so excited to head into 2018 and a new gardening year. I can’t wait to natter with you all as we look forward to a new year of growing our own fruit and vegetables and filling our bellies with the harvest of our efforts. One thing I will be doing over the Christmas break is beginning to plan out my content for 2018. My head and notebooks are already full of ideas for on the allotment, in the kitchen and here on the blog. I’m super excited to work with Dobies in 2018. I’ve used the company to supply me with a lot of seeds over the 10 years I’ve been allotment gardening and I’m a big fan of the fruit and vegetables Rob Smith has put together for his own heritage range. I’ve a sack full of seeds from their fantastic new range to try on the allotment throughout the year. I’ll be giving you the full facts and experience of their varieties of veg and flowers I’m growing on our plot and enjoying in the kitchen. I’ll also be writing a monthly blog for the Dobies website too. Those lovely people at Mr Fothergills have also provided me with a variety of seeds from their new range. I’ve already sown a few seeds of the brand new Lady Salisbury Sweet Pea which has been a new and brave experience for me. I’ll let you know how I get on with these and the other exciting vegetable and flower varieties they’ve very kindly given to me. There are so many plans and projects I hope to deliver on the plot and here on the blog in 2018. I want to get out and about in the New Year. I’ve missed a number of key events during the last 12 months and next year I plan to make up for this. I’d also really love to meet more of you and see your own growing spaces. I’ll reveal more of my hopes and ambition when I return in January. There’s one more fantastically important thing I want to share with you before I head off and trim the tree (and my beard). The brilliantly talented and slightly bonkers blogging duo Agents of Field invited me and a star-studded crowd of bloggers, podcasters and celebrity gardeners to take part in a creative festive sing-song to raise the profile and some well-deserved cash for the charity Green Fingers. I wish you all a Merry Christmas and a Happy Grow Your Own New Year in 2018. Oops. Premature send. Merry Christmas to you and the spade family (are the kids trowels?). As a relative newbie to gyo I grapple with the tricks, the “yes it says that on the packet but do it this way instead”. The secret gyo knowledge. Those are golddust. Also how to get most out of a restricted space. Companion, intercropping, succession sowing, catch crops etc etc. What needs feeding when and how is a bit of a mystery to me. What can be planted as a group, what needs thinning out. All of it really. If you can tell us ALL of it that would be fab! Merry Christmas to the Propergating family! All very good topics to discover. If you find those secrets, let me know too!! 😜 Happy New Year! Wish you and your family a wonderful Christmas and Happy New year, Richard! I am glad to discover your blog this year. It is a great source of gardening knowledge and inspiration! Looking forward to 2018 blog posts! Thank you so much Sasha! Merry Christmas to you too. Wishing you a very happy growing year in 2018. I’m excited to read more of your blog posts in the New Year. Hope you’re a better allotmenteer than a drinker-out-of-the-bottle! You can Photoshop the stoppers out you know! Seriously, Happy Christmas to you and the allotment elf (and the missus). I look forward to following your exploits next year (with guest appearances from the famous allotment chair). Just wondering though, was your voice dubbed? Hi. I’m really enjoying your posts. Looking forward to hearing your blog topics for 2018. The benefits to mental health through gardening are well known but is anyone writing about the ‘community’ aspects of having an allotment? Fresh air and space to think are really important but social interaction with other plotholders is probably another benefit? Hello. Thanks very much for the kind words. I completely agree, I know the allotment has been a benefit to me in each of those matters. I think these are important topics to cover as allotment bloggers. I’m looking forward to reading your posts in 2018 as I know you’ve already mentioned that part of the reason for you taking on the allotment was to obtain these benefits.